Pittsburgh Post-Gazette (Aug. 8, 2017) Goat Rodeo Farm & Dairy in Indiana Township would like to have a hootenanny, and that is to celebrate its Hootenanny. The family-owned farm has been in business for only a little more than two years, but it picked up second place at the prestigious American Cheese Society Judging & Competition in Denver late last month for its Hootenanny in the farmstead category for goat’s milk cheese aged for 60 days or more. First place in the category went to Ruggles Hill Creamery in Hardwick, Mass., and LaClare Farms in Malone, Wis., snagged the third spot. For owner India Loevner, it was like winning the Oscars of cheeses as there were 2,024 entries of cheeses and cultured dairy products for 123 categories at the ACS contest. “We are happy to be recognized in such a competitive level,” she says. Hootenanny, a semihard Gouda, is Goat Rodeo’s latest cheese and hit the store shelves only six months ago. The farmstead cheese is made with spring and summer milk from the farm’s herd of Alpine and Nubian dairy goats. Ms. Loevner explains that the milk is very fresh and richer in taste during those months because the goats are in the pasture a lot, and they have recently given birth to their kids. She believes that happy and healthy animals produce the best milk, which is the start of a delicious cheese. 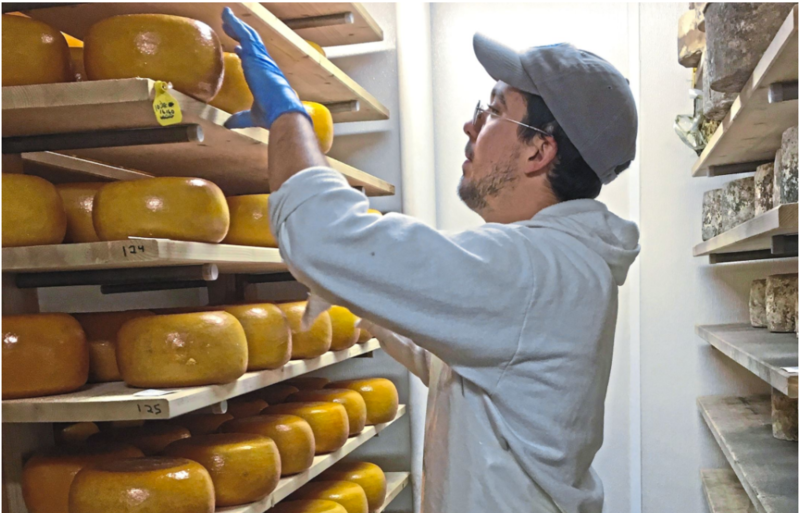 In addition, the farm’s geographical location, pastures and land management practices add a winning flavor, and so does its traditional method of aging the cheese on wood boards, she says. The full-flavored nutty and sweet Hootenanny with a cream wax rind sells in 5-pound wheels, and the wholesale price is $12.80 a pound. It pairs well with any crisp white wine or an amber ale, Ms. Loevner adds. A team effort goes into making the farmstead cheeses (cheese that is produced from milk collected from the same farm), she says, and in particular she gives a shout-out to head cheesemaker Matt Rychorcewicz, who is involved in the cheese production hands-on from adjusting the recipes to checking on how the milk changes. Ms. Loevner came up with the name for the winner. “Sometimes female goats are called nanny goats, and so I was thinking, ‘What do you call goats that are having a really good time? A Hootenanny, of course,’” she says, laughing. The win for Ms. Loevner and her team was a sweet reward. Unfortunately, she was unable to go to Denver to receive the award. “I was too busy with the goats,” she says. Arthi Subramaniam: asubramaniam@post-gazette.com, 412-263-1494 or on Twitter @arthisub.